Porsche introduced the new 2020 911 Carrera S and Carrera 4S, the eighth generation of the automaker’s iconic rear-engined sports car, tonight at the Porsche Experience Center in Carson, California. 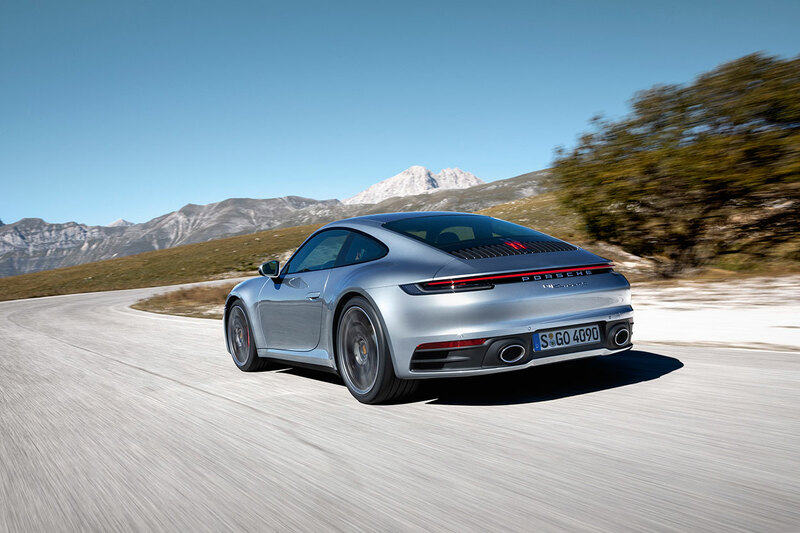 The 992-generation 911 represents an evolutionary change from the 991. A twin-turbocharged flat-six mounted at the rear produces 443 horsepower. Power is sent to the rear wheels in the Carrera S, or to all four in the Carrera 4S, via a new eight-speed automatic double-clutch PDK transmission. Porsche says a manual will be available at a later date. The flat-six uses an improved injection process and a revised turbocharger and intercooler layout to increase efficiency and power. The Carrera S will do o-60 miles per hour in 3.5 seconds, or 3.3 with Sport Chrono package, and go on to a top speed of 191 mph. The Carrera 4S will accelerate a bit quicker: 0-60 mph comes in 3.4 seconds, or a blazing 3.2 seconds with Sport Chrono package. The 4S will reach 190 mph, Porsche says. 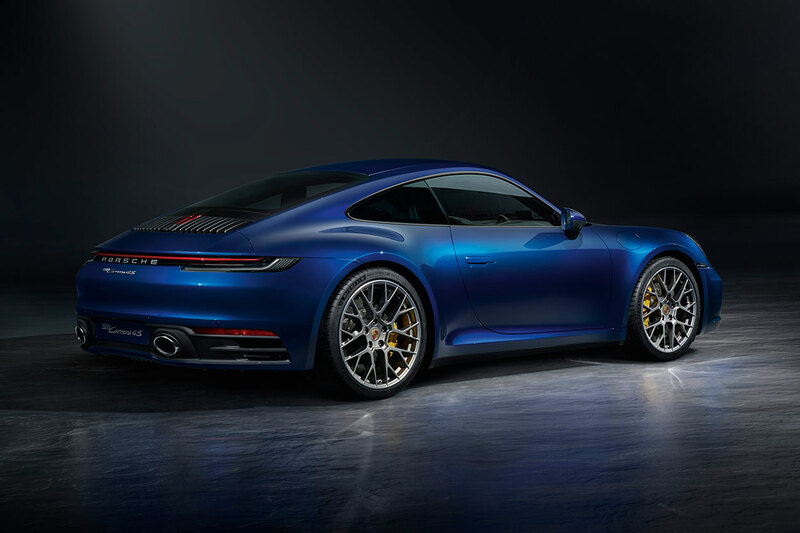 The new 911 is a bigger car than the one before it — and now rides on 20-inch front and 21-inch rear wheels — though it looks unmistakably like a 911. Porsche says the front is 45 millimeters wider, while the rears of both the Carrera S and 4S are the same width as the previous Carrera 4 and GTS. Previously the Carrera and Carrera S used a narrower body than the all-wheel-drive and GTS models. That body is aluminum intensive, according to Porsche, as all but the front and rear fascias are made of the metal. 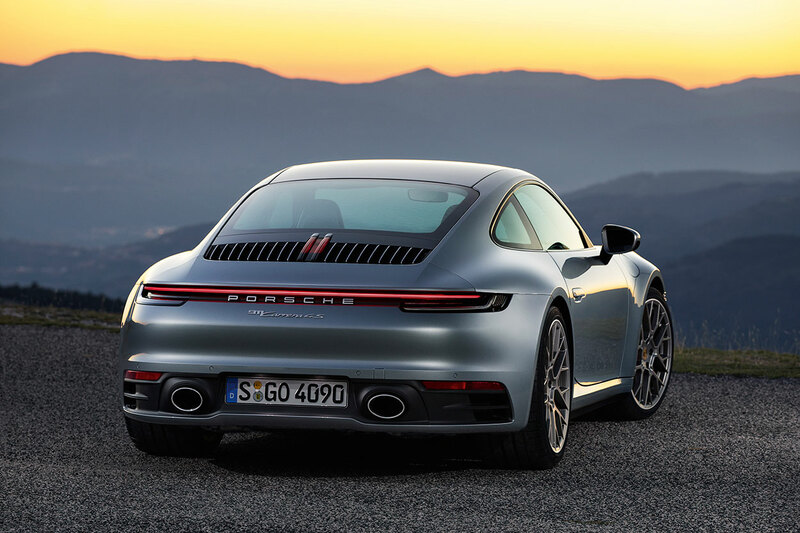 The details are where we start to see how the 992 differs from the outgoing 991. Shutlines are different, the active rear spoiler spans nearly the entire width of the rear end, the taillight bar has now been cemented into the full Porsche lineup, and the exhaust tips poke through the rear fascia, instead of residing under it, à la 991 GT2 RS. Inside, the cockpit looks familiar to anyone who’s sat in a 911. 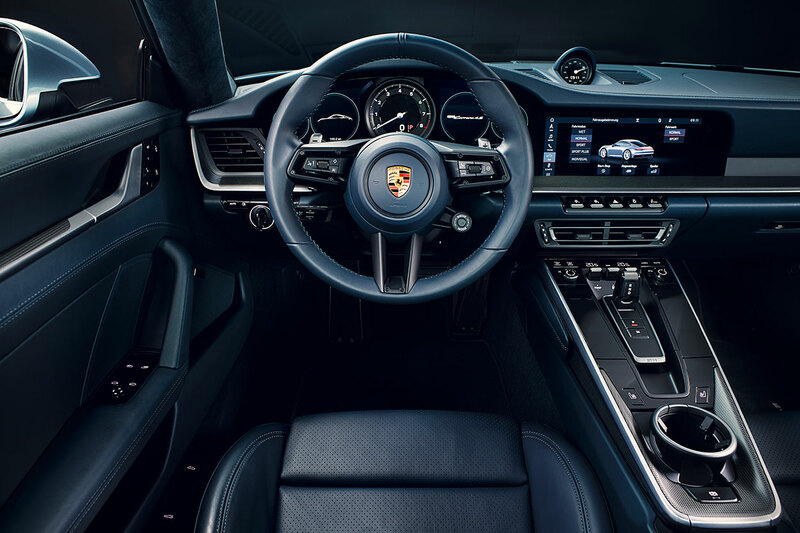 There are classic 911 cues such as a five-gauge dash (even if four of those gauges are digital — the tachometer is analog), but also a modern 10.9-inch center touchscreen and a glass center console with haptic “buttons.” There are also real buttons, switches, and dials. Porsche didn’t give specs on weight, or even mention the base Carrera and Carrera 4, but we do know what these introduction models will cost. Carrera S: MSRP $113,200. Carrera 4S: MSRP $120,600. Stay tuned to PCA.org for more information as it becomes available. 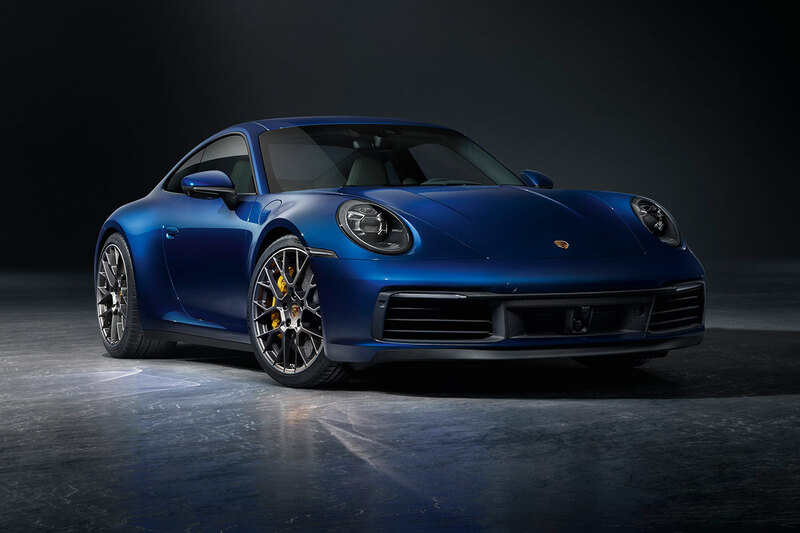 ATLANTA, Nov. 27, 2018 /PRNewswire/ — Faster, more emotional, and more connected – the eighth generation of the Porsche 911 is here. On the eve of the Los Angeles Auto Show, the new 911 celebrated its world premiere at the Porsche Experience Center Los Angeles. With an exterior that unmistakably reflects the Porsche design DNA, a more muscular look, and a completely new interior layout, the new 911 is both timeless and modern. The next generation of flat-six turbocharged engines has been further developed to be more powerful than ever before, delivering 443 horsepower in the S models. Using an improved injection process, as well as a new layout for the turbochargers and intercoolers, the efficiency of the engine has been further optimized. Power is delivered by a new eight-speed, dual-clutch transmission. New assistance systems such as the standard Porsche Wet Mode for increased driver awareness on wet roads, and the optional Night Vision Assist with a thermal imaging camera, are part of the broadened array of available active driver assistance features. The new Porsche Communication Management (PCM) with a larger 10.9-inch touchscreen display (up from 7.0 inches in the previous car) and comprehensive connectivity, optional Adaptive 18-way Sport Seats Plus with improved lateral support, re-tuned PASM dampers, and extended digital features all ensure greater comfort and everyday usability. Previous post: Johnson impresses Alonso with F1 test debut.